Around this time of year, most 12 or 13 year-olds are coming to grips with starting secondary school – new people, bigger classes and longer days. This too is the case for Ian O’Reilly from Moorehall, who started first year in Ballinrobe Community School last week. But school is not the only thing on this boy’s mind. Ian is also busy shooting the second series of Sky One’s Moone Boy, in which he stars as the character Padraic. The first series of the sitcom, devised by ‘Bridesmaids’ and ‘The IT Crowd’ star Chris O’Dowd, was filmed for the most part on site in O’Dowd’s native Boyle, Co Roscommon. Speaking to The Mayo News after his first day of secondary school, Ian seemed ever the professional. He described the day as ‘grand’. Ian has been working closely with funny-man Johnny Vegas, who plays the part of Padraic’s imaginary friend Crunchie ‘Danger’ Haystacks. The second series has already been commissioned by Sky. Ian has been filming since mid-August, but he says ‘hopefully’ he won’t miss too much school. 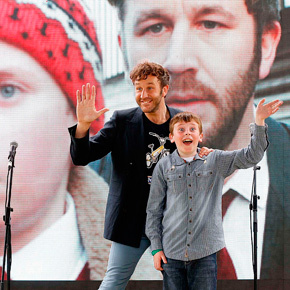 Moone Boy premieres on Sky One on Friday, September 14, at 9.30pm.